Portion out sample drinks or treats in this Fineline Quenchers 401-CL 1 oz. plastic shot cup! This Fineline Quenchers 401-CL 1 oz. 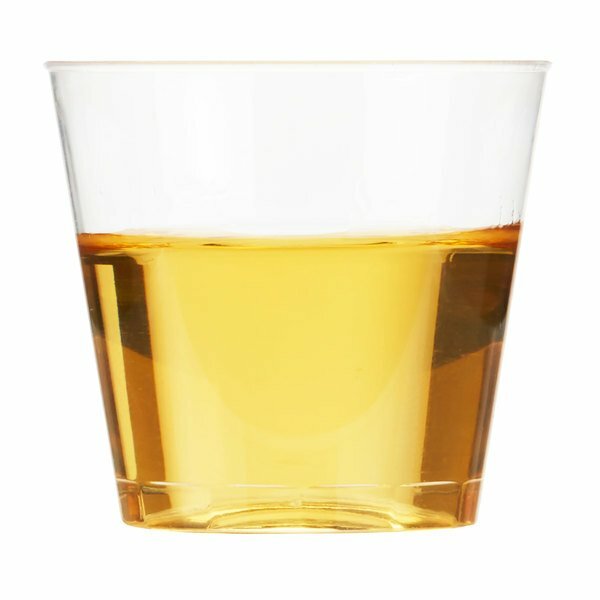 clear plastic shot cup is the perfect size for wine samples, shots, or anything that you want in a portion controlled size. 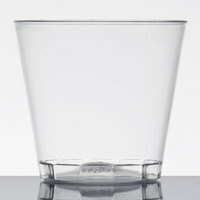 Boasting a crystal-clear construction, this small glass expertly showcases colorful liquor or gelatin shots. While its sleek, tapered sides make it easy to hold and serve, its rolled rim promotes easy sipping and presents customers with a comfortable drinking experience. "These shot glasses are very convenient. They will be great for handing out shots quickly and easy cleanup. The price for these are great as well!" 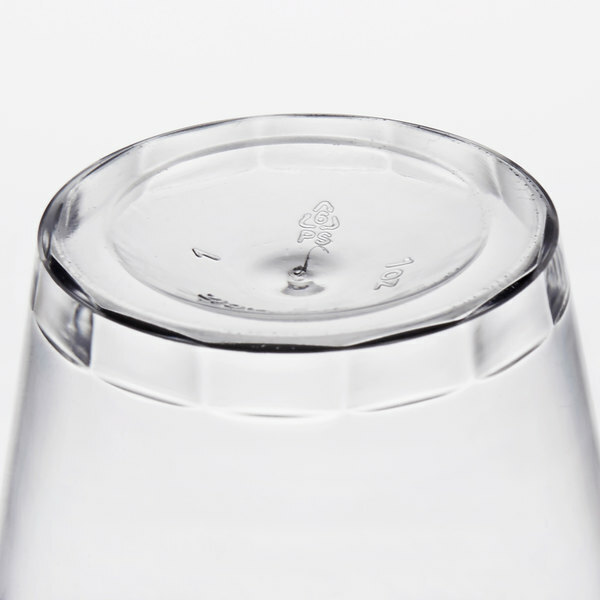 This shot cup's plastic construction gives you superior strength and durability without the hefty cost and risk of breakage that comes with traditional glass beverageware. Its lightweight design also allows for easy product separation, enabling you to quickly grab, fill, and serve it to your guests. 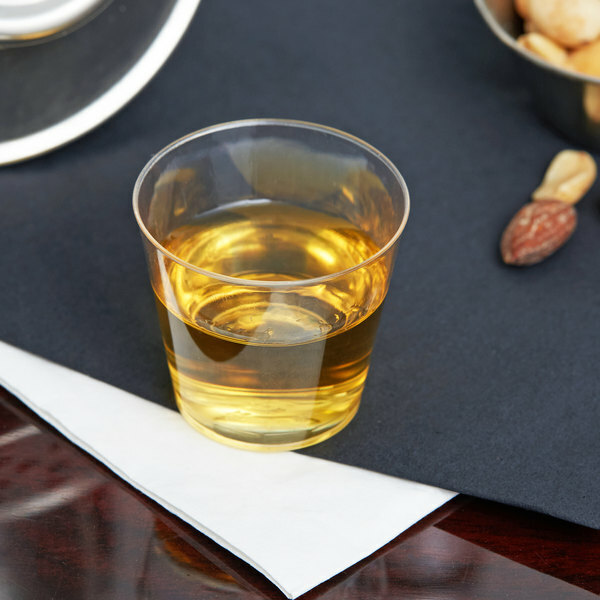 With this disposable plastic shot cup, you and your staff can easily dispose of the cup after use rather than cleaning and storing it for the next event. 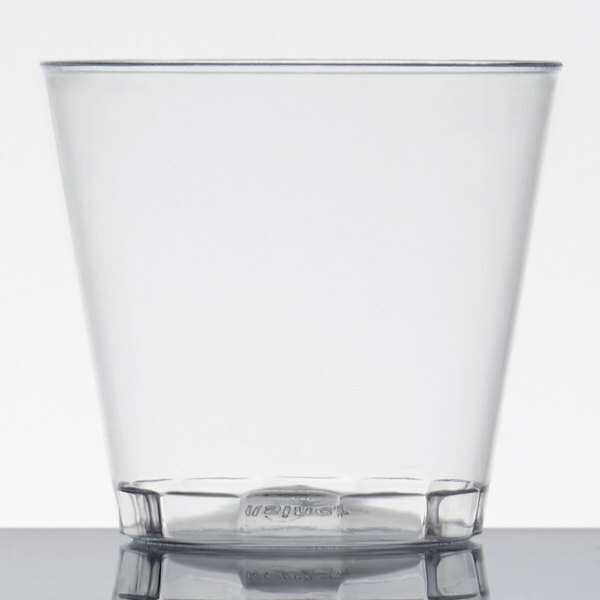 Plus, your guests don't have to worry about returning the glass to the bar once they've finished their drink. Great product and inexpensive. We use these for shots during busy weddings. No way we would be able to use and wash enough real glasses. Items worked great for wedding shot glasses. We way over estimated the number we needed and not have shot glasses to last us a life time. Items are recyclable so if you are worried about the environment that is a good thing. We love these shot cups. They are small and sleek. We like to use them for sampling our hemp mylks and wheatgrass. They offer a classy touch. These shot glasses are very inexpensive and a perfect size for sampling. They allowed our business to give out samples of our frozen margarita and it enticed our customers. 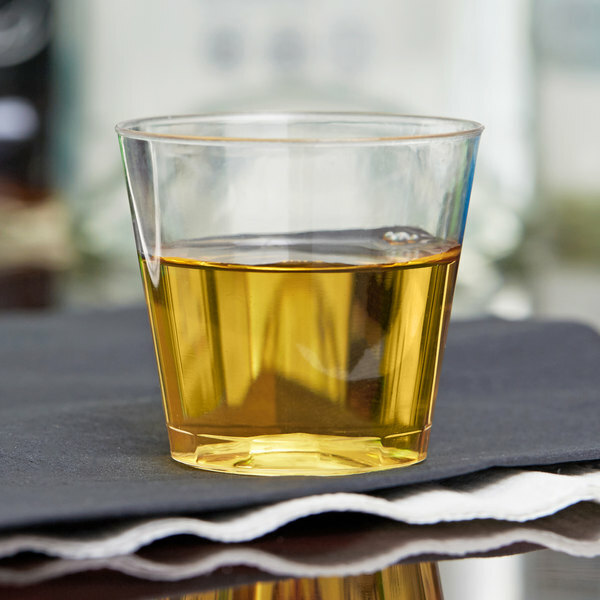 These 1 oz shot glasses are perfect for our use during product demos and sampling events. The clear plastic looks very professional and does not crack in storage when we are loading and unloading. The Fineline Quenchers 401-CL 1 oz. Plastic Shot Cups are perfect for liquor. The quality is good as well as the price. I definitely recommend this shot cup. I use these cups for shots on our outside patio and they are perfect. They do not crack easily and are very economical to use. 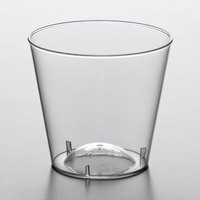 I use these as sample cups for cold beverages and they're perfect. They're broken up into smaller packs, so they're easy to bring to pop-up markets, and I've had very few that were broken. These are great! We used them for weddings for the money dance and they look very nice and are durable. We also use them to place on top of bottles with pourers in them when not in use. These shot glasses are very convenient. They will be great for handing out shots quickly and easy cleanup. The price for these are great as well! Very durable, has a clean finished look, didn't feel cheap and great deal on this item. Delivery was fast, good communication on when to expect my items. We bought these for our backyard wedding. Such a great deal for the amount of shot glasses and the quality that we got. Shipping was super fast and all packages (and we got a lot of them) arrived with no problem. Used the Fineline Quenchers 401-CL 1 oz. Plastic Shot Cup 50 / Pack to hold Whip Cream. Surprise your guests with a quick shot of whip cream. Very appealing to look at. We order cases of these to do sampling of liquid products to customers all around. These have not only been the best but also the best price. We use these when we're giving out shots to all of our customers at the same time for a special occasion or special event. They are great for one-time use and easy to dispose of so we don't have to worry about shot glasses cracking. These mini shot glasses are totally cute for mini desserts. We use a mini spoon to go along with them and the customers just love them! Small, clear and i think durable for its use. These are nice and cheap for a simple disposable shot glass. They do crack easily but as long as your not doing anything special with them, like jello shots, then you'll be fine. Our bar has a signature shot called a mini beer. It looks just like a draught. These 1 oz plastic shot glasses are perfect for our signature shot! 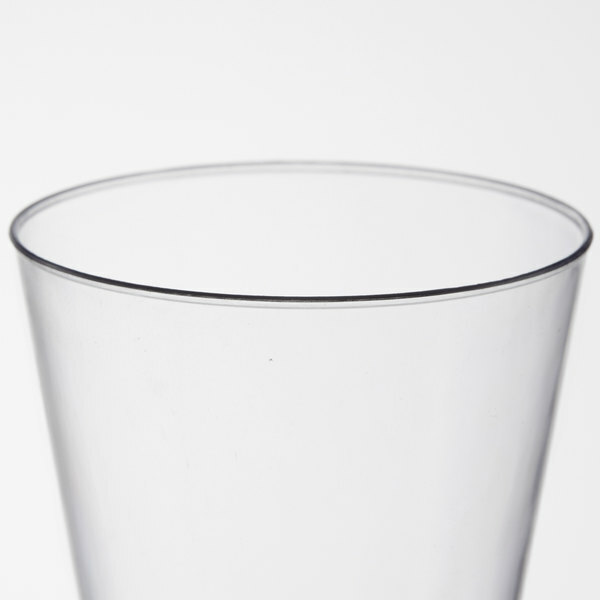 We use these cups for sampling our Liqueur. They are sturdy and look and feel great. They are a lot nicer than other sampling cups we have tried and the price is great. Small size but perfect for individual servings of condiments. Nice to have portion control in an elegant way and no fear of double dipping! Also great in a small plastic cup for a Irish car bomb! These are just the right size for a regular shot. They are very convenient to use when you are busy. Just use and throw away. Good deal for the price. Great shot glasses for days when you have large parties and do not have enough glass shot glasses or sampling product. We use these frequently. These have been a great addition to the bar. 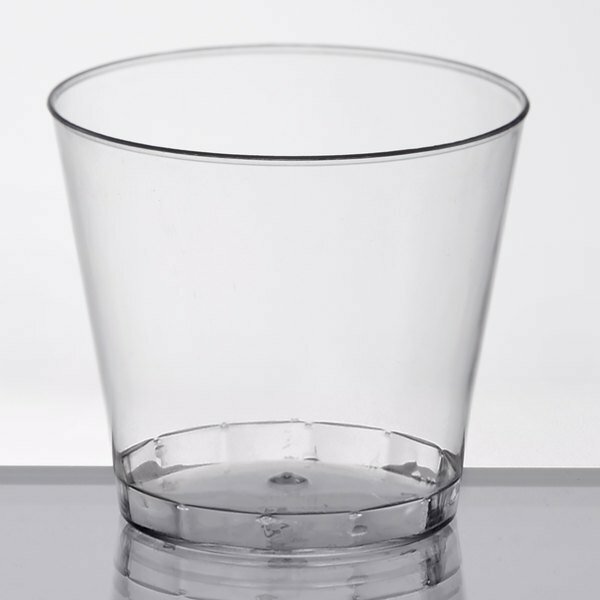 We were constantly buying glass shot glasses because people would steal them or slam them on the bar and chip/break the glass. These cost about the same over time, and you don't have to waste time during a busy night to wash shot glasses. The price on these shot cups are great. We generally order 1 case and it can last us 3 months. Great buy would recommend to others. These worked amazing for my promotional party we had at my bar downtown! They saved me so much money in broken glass!! Very sturdy and very good looking!! These plastic shot glasses were a great inexpensive option to make mini desserts and mini jello shots with fruit. guests kept asking where we got them. They are so simple yet stunning. We use these on our busier nights to cut down on the loss and breakage of our glass shot glass.I would recommend these for any night club to cut back on cost. This product is perfect for small wine tastings and product sampling. It is of high quality and looks very nice. Also great product for resale. Can Somebody say LOVE Them. These cups were a wonderful addition to my collection of dessert cups I brought for a competition my daughter entered. I will definitely purchase more of these. Everyone asked her where she got them from and I gladly told them The Webstaurant Store. These little cups are perfect for sampling beverages! 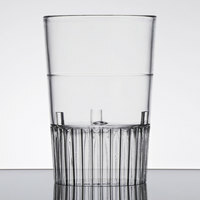 Not only are they transparent so you can clearly see what you're sampling, but they are durable. I definitely give them a 5 out of 5 rating! I loved these they were the perfect size for sample drinks. They came in a large enough quanity that it was very cost effective. I recommend them diffently. Save Up To $11.18 with our Recommended Product! Check out this Choice plastic shot glass instead! 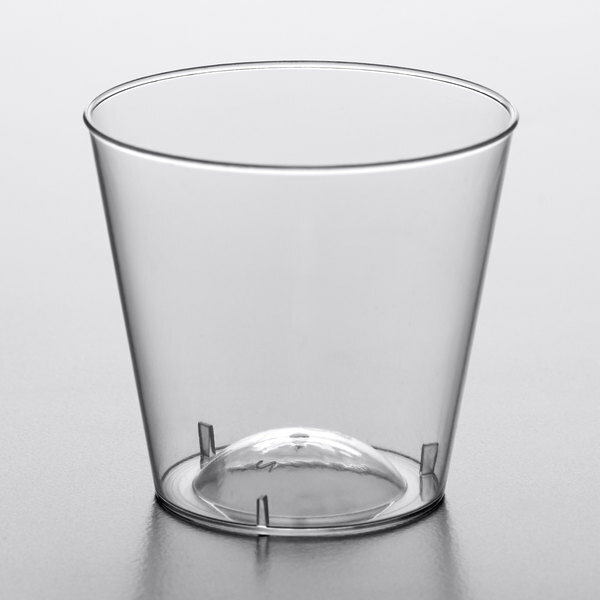 This verstile glass can be used for anything from wine and beer samples, to mini-desserts or appetizers at your catered event! It’s the same size as the Fineline shot glass but offered to you at a more affordable price!